This fun project has been 2+ years in the making and finally made it to fruition. You can customize this project for any holiday, celebration, or event. My favorite thing about this collage frame is that you can swap out the photos any time you want, making this piece of décor very versatile. This tutorial covers how I edited and printed my photos as well as how I put my framed collage together. While this project is pretty straight forward, I've included tips and tricks that helped me complete this project. What is Instagram and How Do I Use it? I've been happily using Instagram for two years now. If you're unfamiliar, Instagram is a free app for smartphone users. It allows you to take square photos, apply decorative filters, blurs, and borders, and post them to your Instagram account for your friends and followers to see. If desired, you can also set your account to private, limiting visibility to only those you allow. Instagram also uses hashtags, enabling you to "tag" your photos with certain keywords or phrases. This process is very similar to Twitter. The hashtag system allows you to find photos and people with similar interests. For example, whenever I post a cute picture of my dog, I always hashtag her photo with the following hashtags: #mydog #alaskanhusky #myhusky. Once posted, my hashtags become links, and clicking on them will show me all the recent photos with the same hashtags. I can then browse photos of other huskies and, many times, I gain new followers or people to follow who also have a pet husky. How to Use Instagram Without Posting? It's important to think of Instagram more in terms of a social media application than photo-editing software because it was designed with the former idea in mind. I've used a ton of photo apps over the years, and Instagram remains my favorite and the easiest to use (in my opinion). The application is very straight forward and there aren't a lot of bells, whistles, or options. 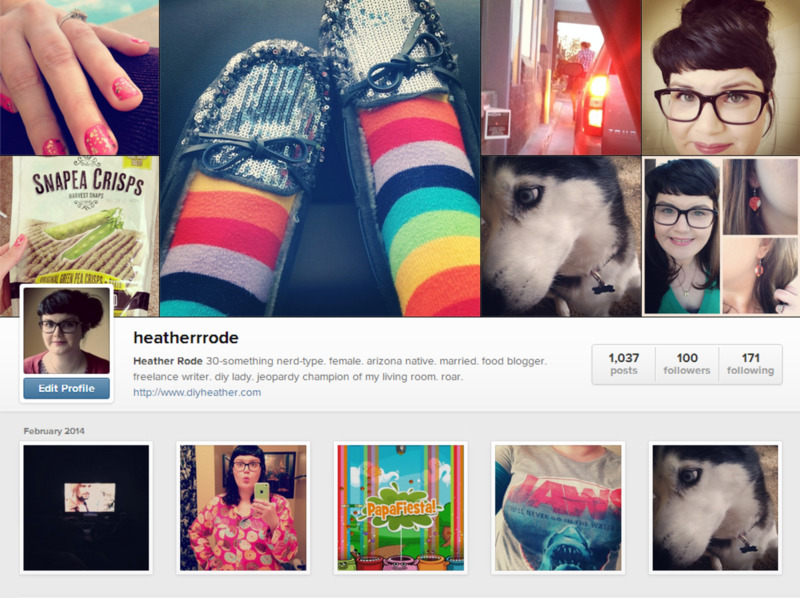 If you hate using confusing apps like I do but want to use Instagram, I'd urge you to try it. After all, it's free and I promise it's not overwhelming. For this project, I applied the filter "earlybird" because I love its vintage glow and charming border. For the longest time, I thought it was impossible to play around with pictures without posting them to my account. Deciding which wedding photos to use for this project was definitely a process. I wanted to be able to apply filters without posting a bunch of random wedding photos to my Instagram feed. The trick to this is actually quite simple. First, be sure the photos you want are located on your phone. If you emailed them to yourself (from your desktop computer to your iPhone, like I did), make sure they are saved to your phone before activating airplane mode since you can't access your email in airplane mode. Put your phone in "Airplane Mode." Open Instagram and apply borders and or filters. Your photo should have a failure message next to it but it will be saved on your phone images. If you're having difficulty locating your photo, check all of your photo folders on your phone, especially your Instagram file. Your failed Instagram upload should have a circular arrow and an "x" next to it. Tapping the first button will "retry" posting your photo (although it won't as long as it's in airplane mode). Tapping the "x" will remove the new photo from your upload queue. Leaving it there, it will most likely post as soon as airplane mode is turned off and you're connected to the internet again. If you don't want it to post and show up in your feed, be sure to tap "x" to delete it as soon as you see it has been saved to your photo collection on your phone. Where Can I Get Instagram Photos Printed? Once I was happy with my photos, I connected my iPhone to my computer and copied and pasted the files to a flash drive. (You can even order photos online by uploading them to the Walgreens Digital Photo Printing Website. Simply pick up your finished photos at your neighborhood Walgreens.) I then took my flash drive to my local Walgreens and printed them out using the photo kiosk at the photo counter. If you can do simple functions on a personal computer or smart phone, you shouldn't have any issues using the photo kiosk. If you've never used one of the photo machines before and you're nervous or intimidated, don't be afraid to ask for help. The girl who regularly works in the photo processing department is always so happy to help me out if I have a problem. Walgreens offers photo finishing in square photo print sizes 4X4 and 8X8-- perfect for instagram photos. My instagrams are printed in 4x4, in case you were wondering. I spent less than $4.00 to print my instagram photos for this project. Who knew printing instagrams was so easy? 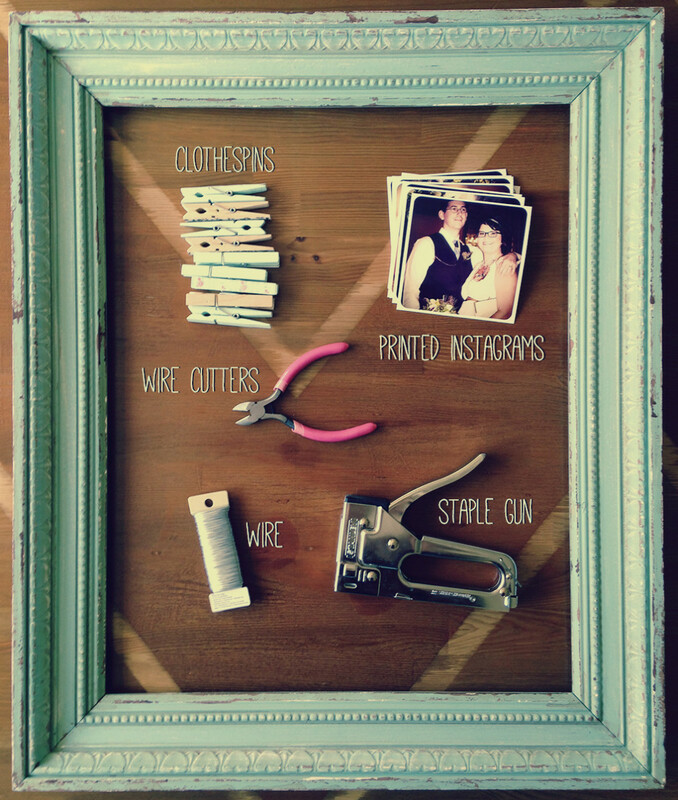 Once your instagram photos are printed and picked up, you're ready to make this collage frame. 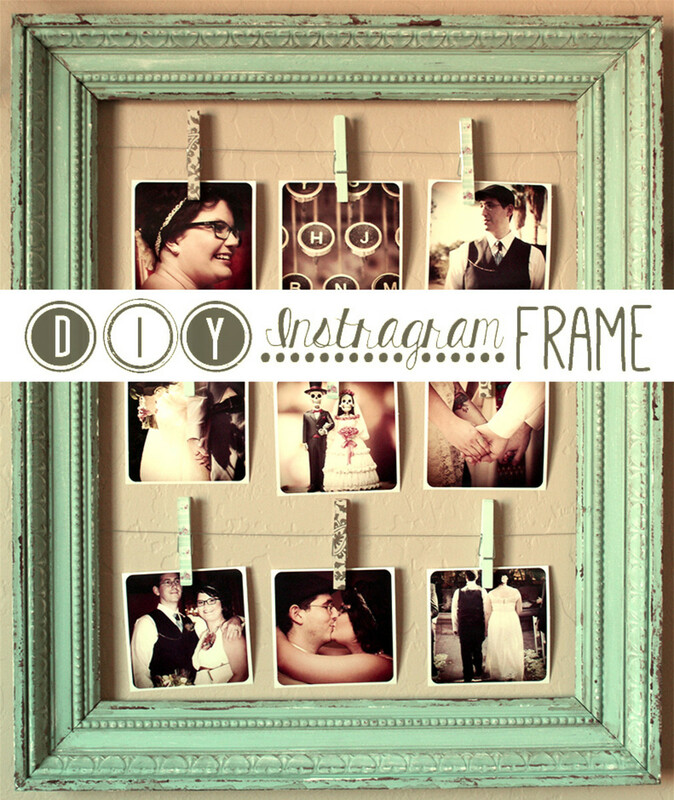 After you have your printed instagram photos, the next most important component is your frame. I picked up my frame at a local antique store over two years ago. I fell in love with this frame the minute I saw it and it was only $7.00! It didn't have glass or a backing but I bought it knowing I was going to use it in some kind of DIY project. Thankfully, my frame was already painted and the paint job is one of my favorite things about it. You can achieve a look similar to mine by using three shades of paint. 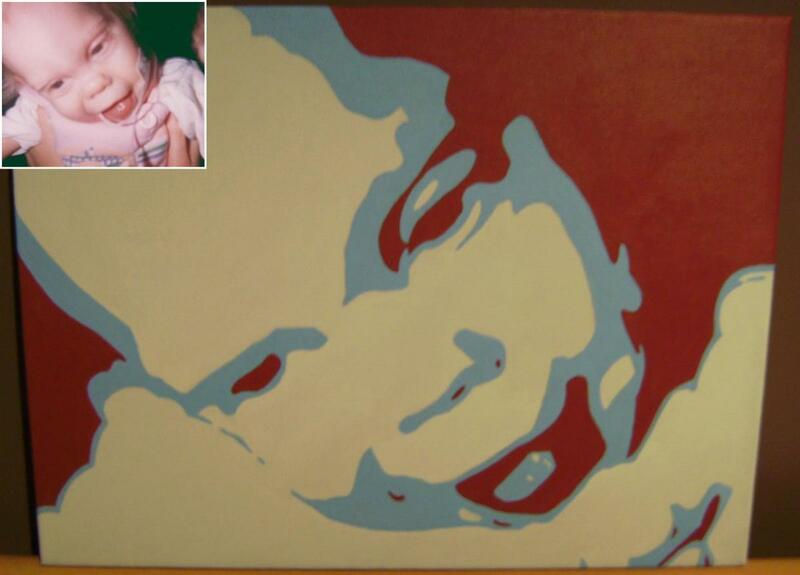 This frame is painted in a Tiffany blue color and details are highlighted using white and brownish red paint. Paint your entire frame a solid color. When dry, use a rag and rub tiny amounts of white paint over scroll work or carvings on your frame. This simulates wear and distress. Using a Q-tip and brownish red paint, you can messily paint random globs and streaks along the edges of your frame. This simulates chipping paint and gives a fake peek-a-boo effect of darker wood showing through. If you need inspiration, surf the web (especially Pinterest boards) and take a trip to your local paint counter. If you plan to hang your finished frame, check to see if your frame already has hardware on the back. If not, you will also need to pick up a picture hanger from the hardware store. They're very inexpensive and you usually get two or more in a package. This frame can also sit on a tabletop or mantle and lean against the wall behind it, negating the need for hanging hardware. Both looks are lovely. The frame is probably going to be the most expensive component for this project. To save money, you can explore Goodwill, yard sales, craft stores, Craigslist, etc. Clearance sections are also a great place to look since dings and defects will be easily hidden if not welcomed. 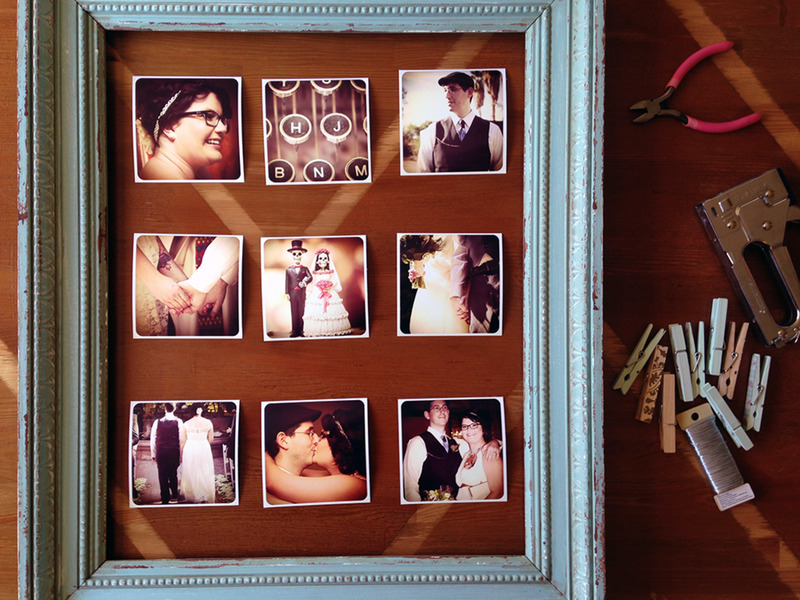 Decide if you want to purchase a frame or make your own. Depending on what is available in your area, one option may be more expensive than the other. 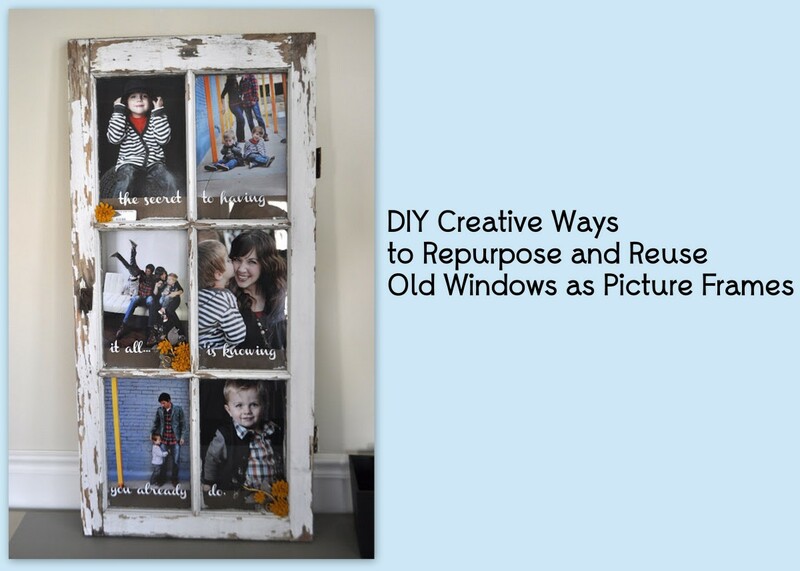 Consider making your frame out of reclaimed or recycled wood (i.e. using the lumber from a wooden pallet or lumber pieces that a neighbor might be throwing away). The light turquoise clothespins in this project were purchased long ago at Michael's on clearance. 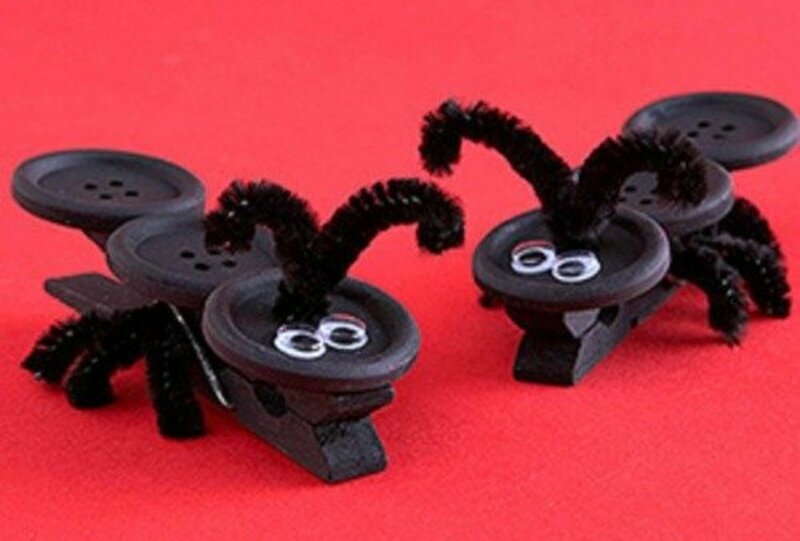 I purchased them because they were only a $1.00 and were too cute to pass up. I never planned on using them in conjunction with my favorite frame and it just so happened that the colors matched almost perfectly. 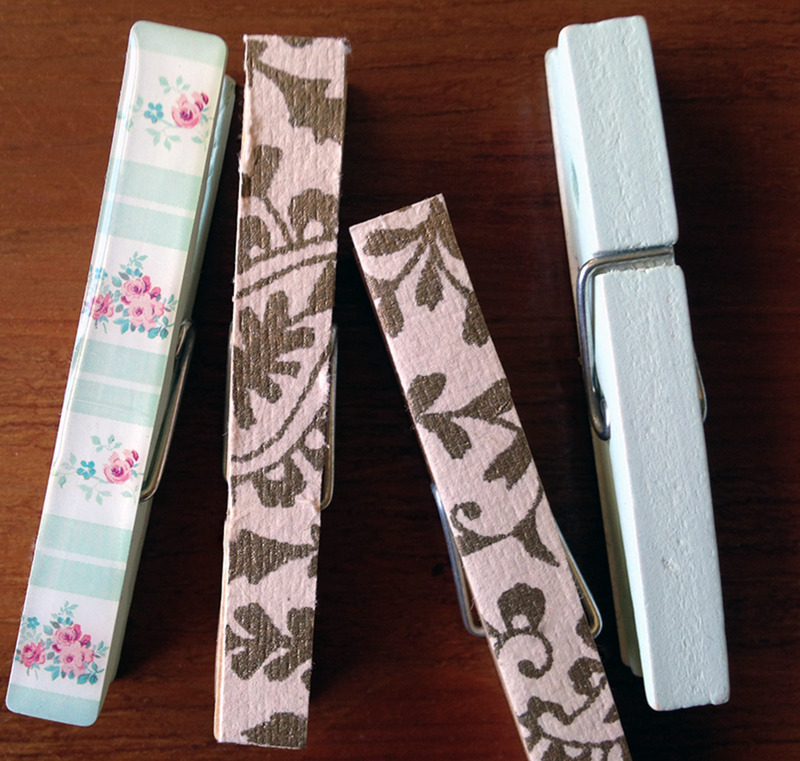 I didn't have enough blue clothespins for this project so I gave some of my plain Jane clothespins some scrapbook paper makeovers. This is a perfect way to use up scraps of scrapbooking paper that one might otherwise throw away. 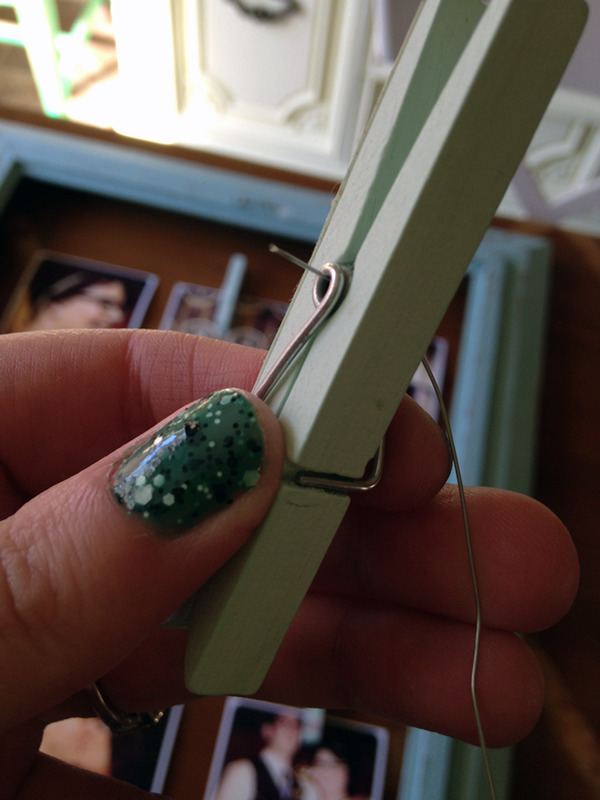 Simply place three glue dots on a plain wooden clothespin (top, middle near spring coil, and bottom). 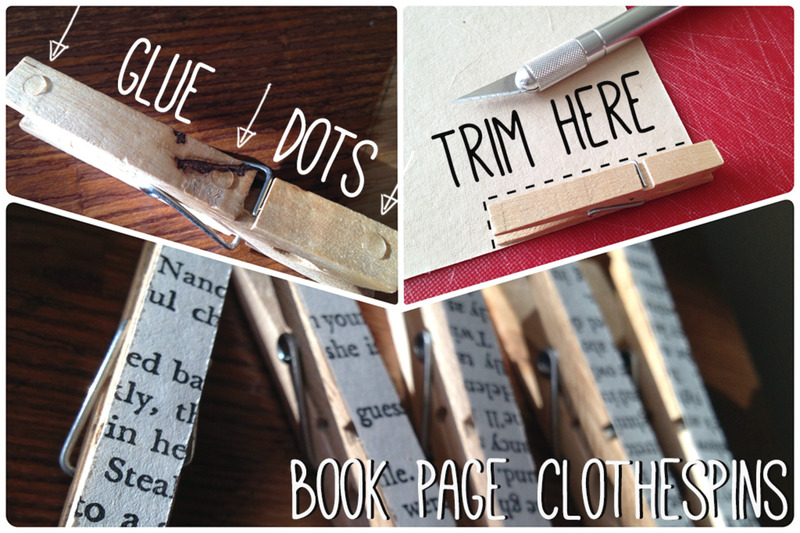 Position your clothespin onto paper (glue dot side down) and press to adhere. Use scissors or an Exacto knife to trim. If working with new or large pieces of paper, start by placing clothespin at the corner edge of the paper and simply trim the other side(s). See diagrams below. This makes the whole process quick and easy while reducing cutting/trimming and helping to keep your cuts straight. This is a great time to figure out how you want your collage to look. Will there be a theme? Will the pictures tell a story? Keep in mind that you can change the sequence of photos at any time. I mostly did this to help me vertically space my rows of photos. My photos tell the story of my wedding day and are mostly in chronological order although that wasn't entirely planned. The first photos were taken while my husband and I were getting ready. We hadn't seen each other at this point and our photographer also snapped a closeup pic of the vintage typewriter on our guestbook table. I decided it was aesthetically pleasing to have our faces turned towards one another (as opposed to away from each other). What a happy little accident that on a qwerty keyboard, H and J are right next to one another (my husband's name is Jason). This photo worked perfectly between our singular portraits. Taking a minute to arrange your photos may help you discover nuances like these that will enhance your finished project. Flip your frame over to expose the backside. My collage has three rows, so I used three pieces of wire. Make sure your wire is long enough to attach to each side of the back of your frame before cutting with wire cutters. It's better to cut your wire longer and trim excess later than to have wire that barely reaches and possibly sags. You can use a ruler for exact spacing however, I just "eyeballed it." 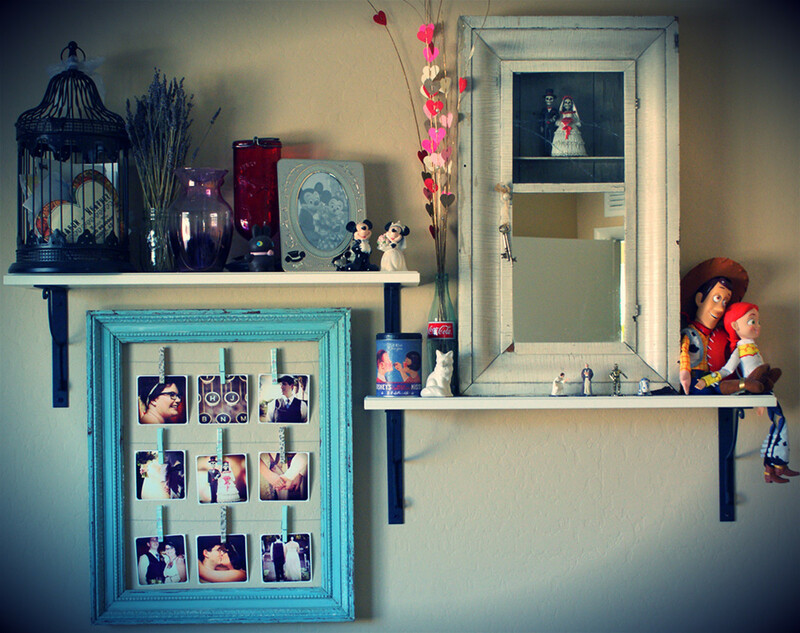 I attached a photo to each clothespin and strung three photos on each wire. When each row contained a wire with three photos and three clothespins, I adjusted the vertical spacing before stapling. To ensure even vertical spacing without using a ruler, I stapled my center row first. Then I vertically centered my first row, using the top inside of the frame and my middle row as guides. I stapled my third row last, using the middle row and inner bottom of the frame as guides for centering. Trim excess wire if necessary. 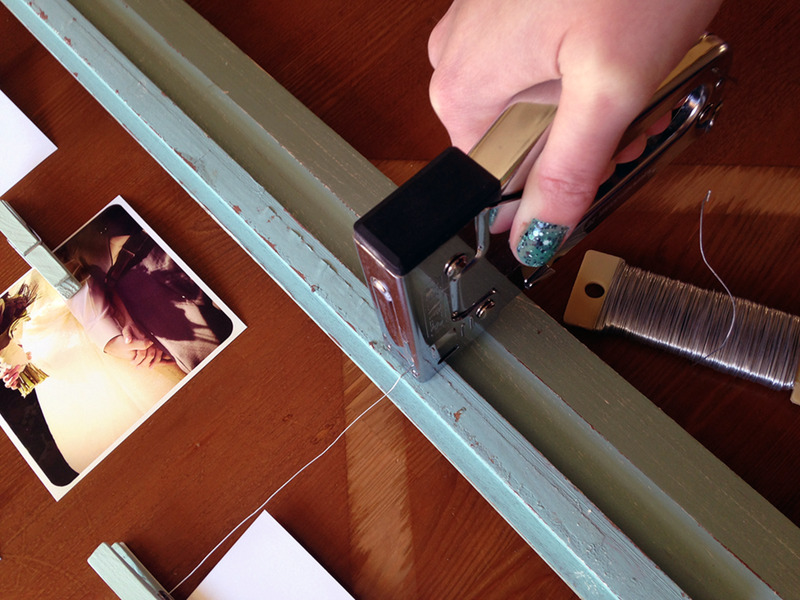 Use a staple gun, not an office stapler. Staple with your dominant (strongest) hand, and use your free hand to apply downward pressure to the top of the staple gun. My free hand was taking this photo, but my staple gun has a black comfort grip which makes it easy to see exactly where I mean to place your other hand. This pressure really helps to sink your staple into your wood frame and leaves no wiggle room for your wire. Staple one side, pull wire taut to other side, and staple. This will get rid of slack and eliminate sagging displays. I had a lot of fun making this collage. 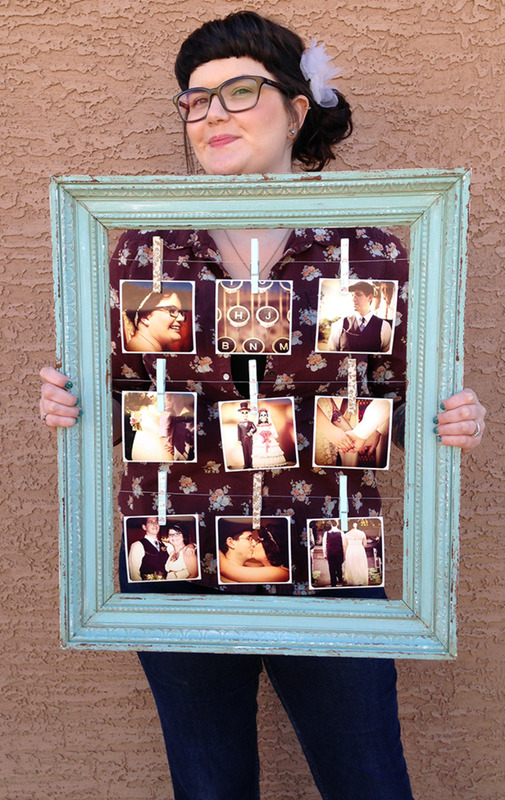 I finally found the perfect use for my favorite old frame and turned some of my favorite wedding pictures into art. This project is so easy and inexpensive—I probably spent less than $12.00 altogether! 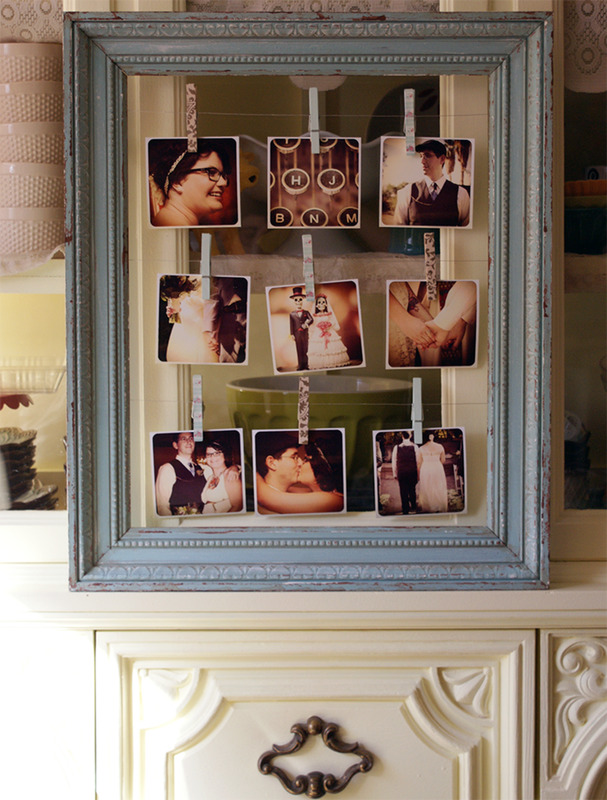 This collage is a great way to display wedding photos and family photos. Best of all, it's easy to change out photos as your family grows. This collage frame would also be a great gift to make for someone. You could include your own photos or leave it blank for your favorite Instagrammer or phone photographer in your life. If you make this project and post it online, let me know—I'd love to see it! This is a very clever way to capture special moments. I can see why you fell in love with that frame. It is gorgeous! This is a wonderful project and you have provided perfect instructions. Your frame looks awesome and so creative! I loved going through your hub This idea is suitable for customization as well in so many different ways. It will make a great gift item as well . Lovely! I know someone who´s gonna love it so I´m definitely sharing your article:-) Thanks a lot! Hi Heather - Trying to catch up on commenting and wanted to stop by. I love this idea and my daughter went gaga over it. She wants to do one with our 2 dogs being the main focus. There is a certain frame in our house that she wants, but that would mean taking out the painting. She'll have to wait until we hit a second hand store. Nice hub! Super cute idea! I'm new to Instagram and I had not even thought about the many possibilities for printing Instagram pictures. 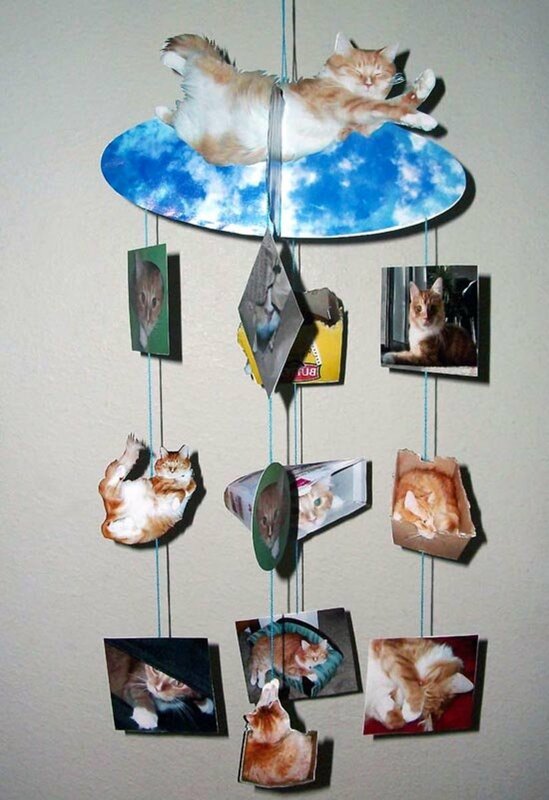 This is awesome and I will definitely try to make one myself! I loved this new hub, there wasn´t a better, more beautiful, attractive and fun way to edit and present this hub. Still a fan of your work. Definitely worth sharing and voting up. This is such a great idea! I want to give it a try. I will be getting married next year, so I will be looking for creative ideas like this. Thanks for sharing! P.S. Your flowered shirt is super cute! 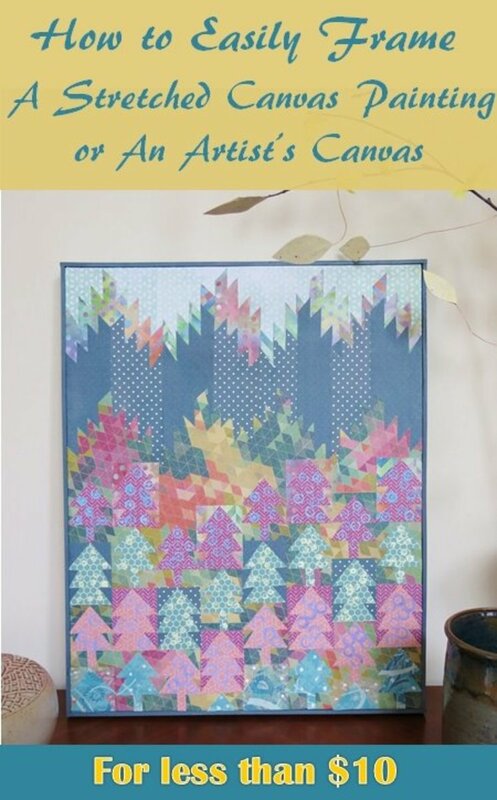 Great looking project, and I can see all sorts of possibilities for this, like baby's first birthday, first day of school, and on and on! Thanks for sharing this awesome idea. Pinned and shared, of course! I can only echo the comments before me! 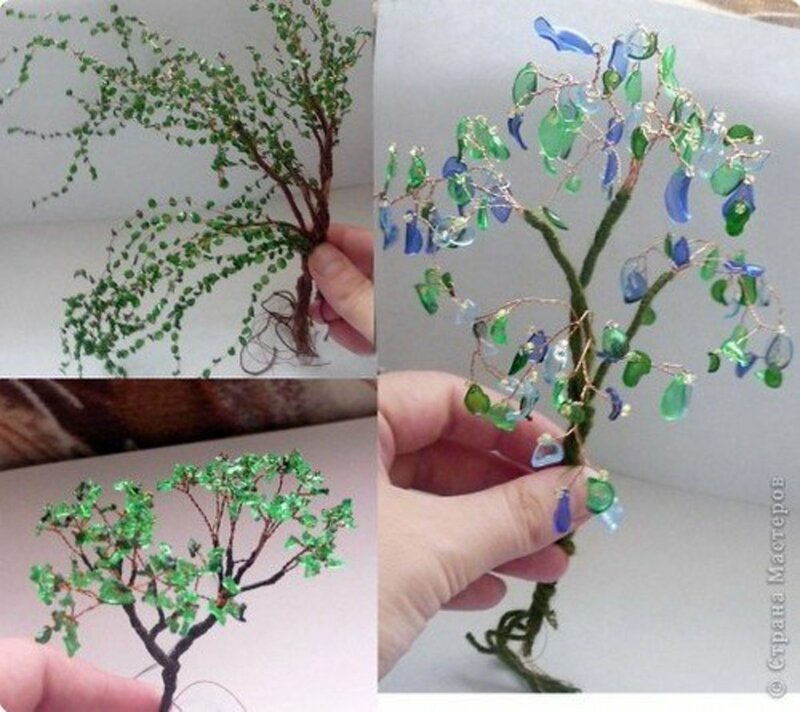 How original, creative and beautiful! I'm always taking pictures and looking for different ways to display them. This is perfect for me. Voted up, useful, awesome, interesting, and pinned. 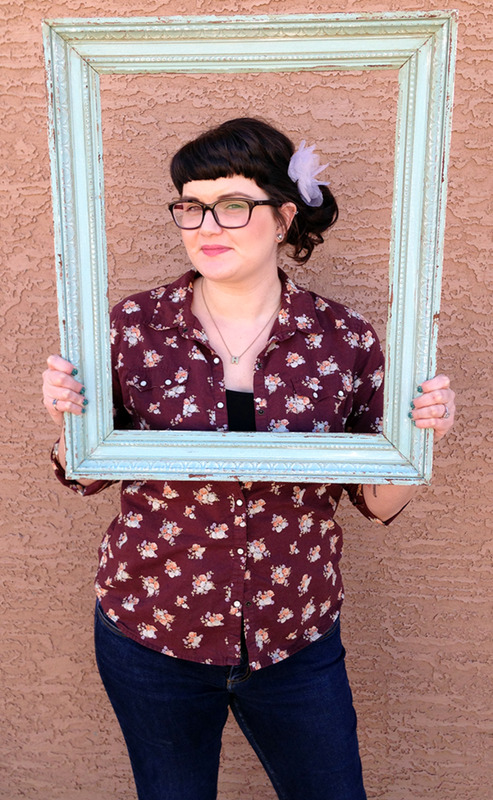 Your frame is too awesome, Heather! I love everything about it. This concept is so easy to customize in so many ways. 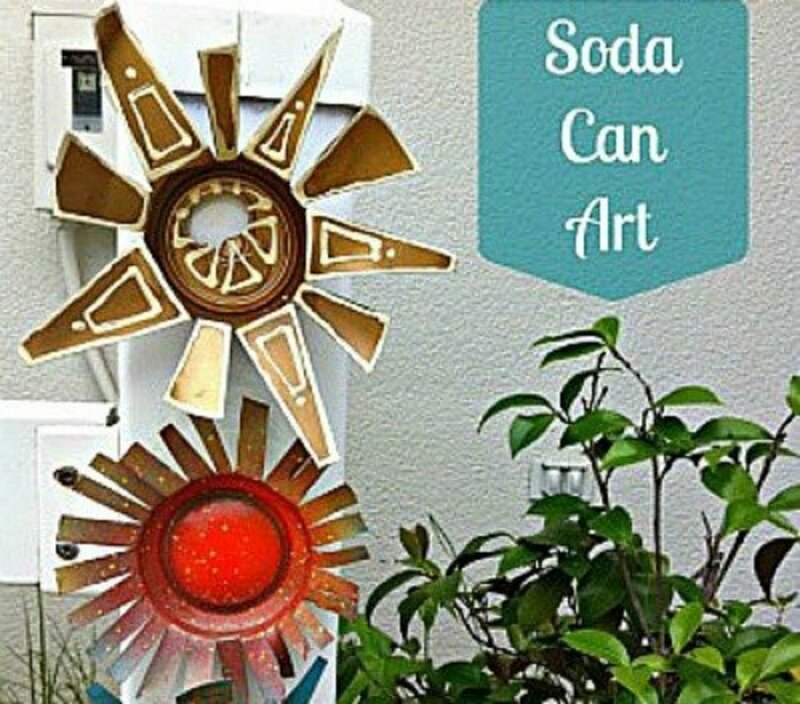 It makes a great gift or home décor piece. Thanks for sharing. Pinning! Interesting and very useful . Thanks for sharing Heather and voted up. Seriously beautiful!! And I love instagram picture projects!! Voted up. Nice work! I love what you did with your frame :) I've been looking for a nice frame for ages, to do a similar work but I haven't been very lucky... I guess I should really try antique shops, and keep my eyes open! I normally don't have a good eye for this sort of thing.